Each year, the fourth of May provides an opportunity for creatives at agencies across the world to come up with the best Star Wars puns and shareable images they can. The unofficial Star Wars Day generates buzz and creates a rare opportunity to connect with fans of the series and the emerging “geeks are cool” crowd. Let’s look back at how some of the world’s biggest brands took advantage of the annual celebration, while celebrating the winners and mocking the losers. From the opening ceremonies in Sochi to the feel-good videos of the holiday season, I have compiled my picks for Canada’s fourteen best social marketing campaigns of the year. Spanning industries from auto manufacturers to sports franchises, crossing through the private sector and government agencies, from viral videos to customized websites to a renovated house in suburban Calgary, spend some time getting to know the marketers who are setting the pace on social platforms as we leave 2014 and launch into the new year. This week’s wrap-up includes the web’s newest platform which promises to pay users, updated privacy measures for Canadian military personnel, and Facebook’s new app which takes mobile users back to the days of chat rooms. 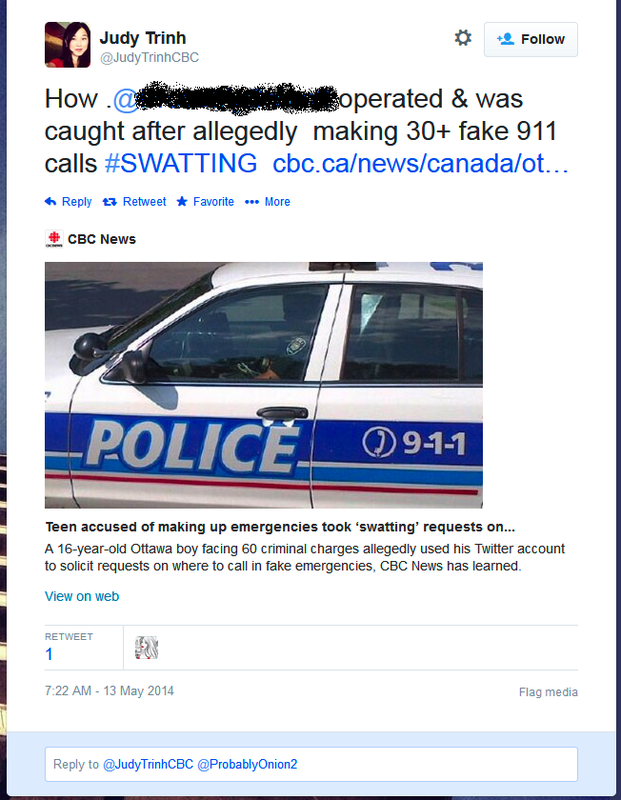 On Monday, CBC Ottawa broke the news that a 16-year-old from Barrhaven is facing 60 criminal charges related to “swatting,” which apparently involves placing 9-1-1 calls in the hopes of attaining a large emergency response. The boy is allegedly behind thirty false alarms across the continent, including fake bomb threats at schools in Calgary and Milton. According to the CBC, he also allegedly used Twitter to take requests for future targets. In both the print story posted to the website, and a broadcast story run on the evening news program, the boy’s suspected Twitter handle was made public. On the broadcast, images of the account’s feed and recent tweets were also displayed. Judy Trinh, the CBC correspondent who reported on the story, also tweeted a link to the story including the handle of the accused. Within a couple of hours of the story breaking, other Twitter users began to reply to past tweets from the boy, many of them discussing hi future in jail. Here’s a screenshot of CBC reporter Judy Trinh’s tweet which links to the accused’s Twitter account. The handle was faded out by me. Others who apparently knew – or at least followed – the accused, included his first name in tweet streams linked back to his account. This is where things start to get dicey. Citizen journalism just got a whole lot more high-tech. CNN is bringing iReport, their citizen journalism site that allows anyone to post content free of editing, fact-checking, and screening, to Google Glass. This will expand the opportunity for iReporters to submit video and photo coverage of breaking news as it happens. As with all other content on iReport, CNN can choose to edit and ensure the validity and credibility of photos or videos taken with Google Glass, and broadcast them on their platforms during live, or recorded, news coverage. Using user-generated content in order to stay on top of spot news is nothing exclusive to CNN, of course. In times of immediate breaking news, especially during times of emergency (natural disaster, security concerns, etc.) TV news outlets scramble to ask permission to use tweeted photos or call for their viewers to submit content to them. The tragic events and subsequent investigation of last year’s Boston Marathon bombings became one of the first real explorations of the power of crowdsourced news during crises in the U.S. In Canada, a shooting in the food court at Toronto’s Eaton Centre demonstrated the same shift north of the border. While news teams rush to gather their equipment or redirect their van to the scene of events, smartphones and tablets of those on scene were already capturing the action. The major broadcasters repurposed tweets, Instagram photos, and YouTube videos of the scene at the Marathon’s finish line. During the pursuit of the perpetrators in the following days, the news media relied on social media to get images of the police sweep. Andrew Kitzenberg had his photos of the manhunt shared across not only social media, but the television screens of major broadcasters. CNN even profiled Kitzenberg in the video below.